There are a few garages located near the restaurant. Icon Parking is on 8th Street between 5th Avenue and University Place, as well as on 10th Street and Broadway. We are conveniently located a few blocks away from Union Square, which the N, Q, R, 4, 5, 6 and L trains are all located. 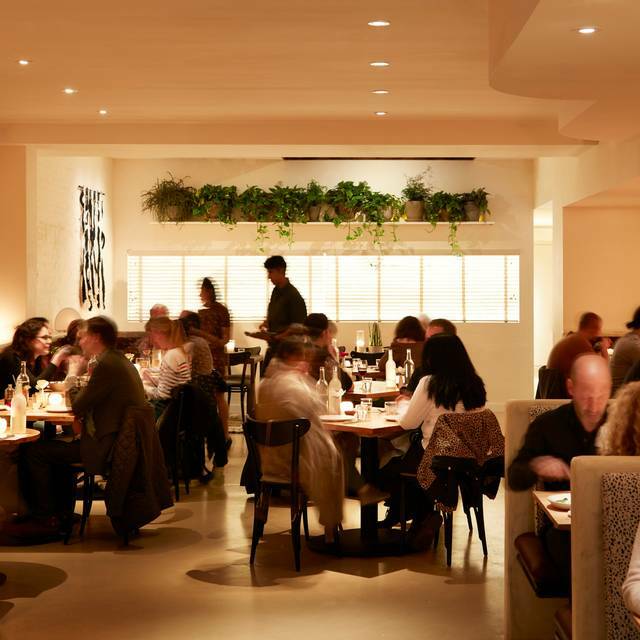 Nix is a new restaurant from Michelin-starred chef John Fraser, drawing on his personal passion for cooking with vegetables. The menu features an array of affordable and seasonal dishes, largely sourced from the Union Square Greenmarket, along with an innovative list of cocktails and wines. 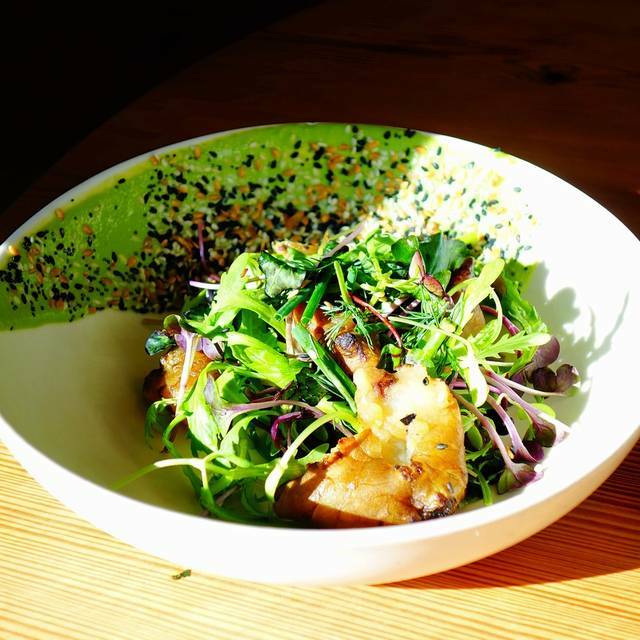 Nix is open for dinner nightly, lunch on weekdays and brunch at weekends. Nix is a grown-up, entirely vegetarian and vegan establishment, in an area near Union Square previously lacking in both such kinds of places. The most flavorful dishes with incredible service. I had a wonderful birthday lunch with my family at Nix. Everyone loved their food, and the waiter was lovely. The restaurant is quiet, peaceful, and artfully arranged. We sat in a booth, which was perfect. Great fine dining vegetarian experience. What a great spot. Delicious food, great selection, great service. The tandoori pineapple dessert special was amazing. Das Essen war in erster Linie sehr scharf gewürzt, so dass sich leider gar nicht beurteilen lässt, ob es geschmackvoll zubereitet war. Der Gastraum war auch noch sehr laut und dunkel, so dass der Aufenthalt insgesamt eher negativ in Erinnerung geblieben ist. I loved the starters, entrees and cocktails. However, I felt the dessert portion was really large (definitely recommend sharing 1 per 2 or even 3 people) and not as WOW as the other dishes. I'd eat there again in a heartbeat! La comida súper rica. Los platos son diferentes. My wife and I took my mother and my sister for my mothers birthday. The food was excellent and the people were very nice. My biggest problem was how expensive the restaurant was. A dish that has four pieces of cauliflower in a special sauce costs $24! I didn’t realize when I ordered two orders of the cauliflower Dish. The price was on the menu, but I simply didn’t notice. 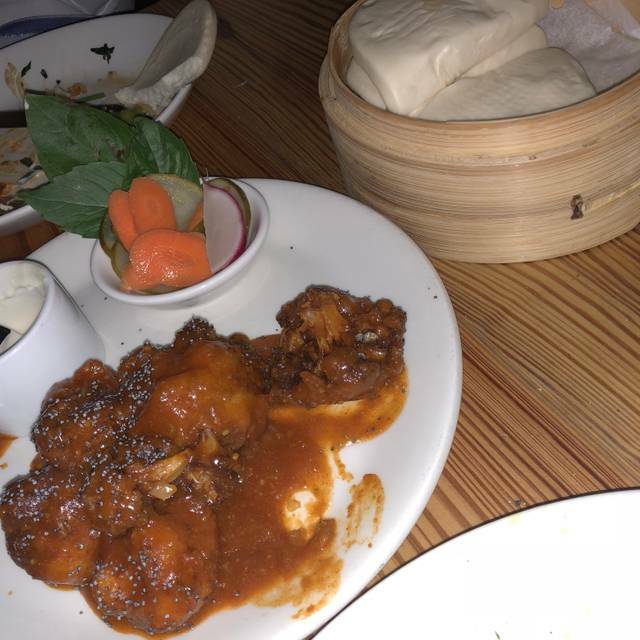 When the bill came and I saw we were charged $48 for two cauliflower dishes, I was floored! I appreciate restaurants having very good vegan options, which they do, but the prices are simply too expensive. We also ordered a fairly simple spicy tofu dish, and it was $28! Lastly, as a starter, they have bread with choice of dip. They charge $7 for 1 piece of bread, and $7 per dip! We ordered bread with 2 dips, and it came to $21! For 1 piece of bread!!!!! Sorry, it’s just too ridiculous. A very comfortable, elegant, but casual dining experience with excellent service and food worth fighting over it is so good. I would recommend Nix to anyone. A Michelin star should be reserved for only the best across the board. The service was all over the place. Lots of waiting around and they did not respond to a request for an additional side of rice. The manager and waiter both were very apologetic, but I don't really understand how that helps. I felt like their regular staff called in sick and they shipped these people in from an Applebees in Georgia. If that actually is their service staff, I can't understand how people still give this place their money. They must do big business with out of towners. 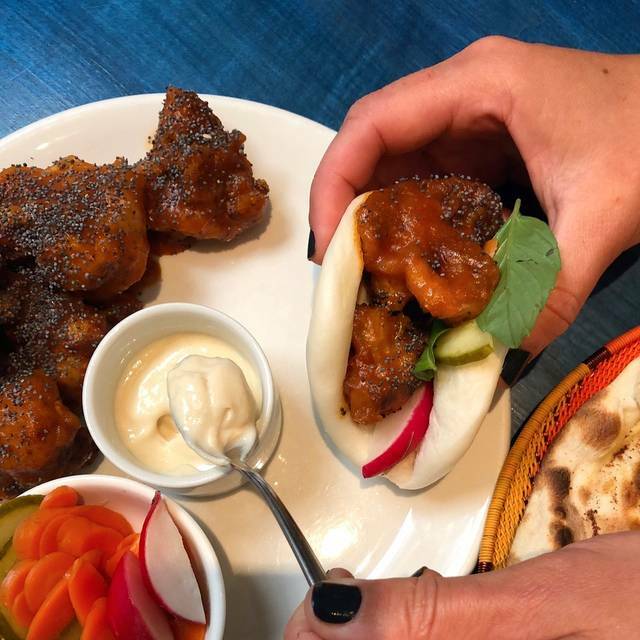 The food was good, but felt like a culinary student was excited about the challenge of a meatless menu and went way overboard with random selections that had absolutely nothing to do with each other like steamed buns, gnocchi, hummus and tandoori bread. Maybe its meant for stoned rich vegans at NYU...actually that would make the most sense. Anyway with the bill there was a postcard claiming the name of the restaurant comes from the supreme court case deciding the tomato should be categorized as a vegetable instead of a fruit. That actually could have been a great jumping off point for a cohesive plant based or vegetarian menu. Or at least worth mentioning before I'm on my way out. For the last time lol. Overall the food was good but the service was not up to the level I was expecting for a Michelin star restaurant. Amazing vegetarian food in the heart of nyc! We tried the cauliflower tempura buns (loved it! It’s a must), tandoori bread with eggplant hummus, burrata with broccoli and salad with champagne vinaigrette. The amount of food was perfect for two people. 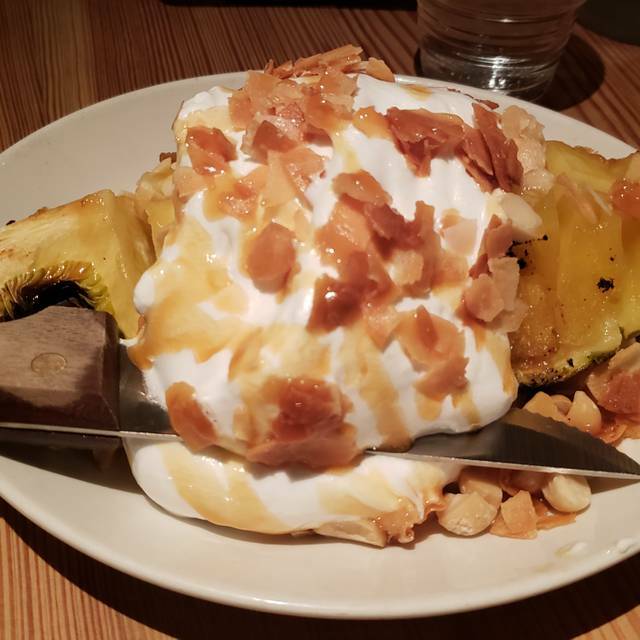 Of course we took the pineapple dessert - and it was so good. We had a great time celebrating our 10th anniversary here! Great food quality. Good vegan options. Very busy for a Wednesday night. Service was average. Would go again. Wonderful service and food. Will return and tell others! Our meal at Nix was outstanding. It’s rare to get dishes this good, let alone on an entirely vegetarian (or vegan, if you choose) menu. Besides wine by the glass, we had the Nix signature cocktail (vodka, strawberry, mild chili) which was an excellent way to start. 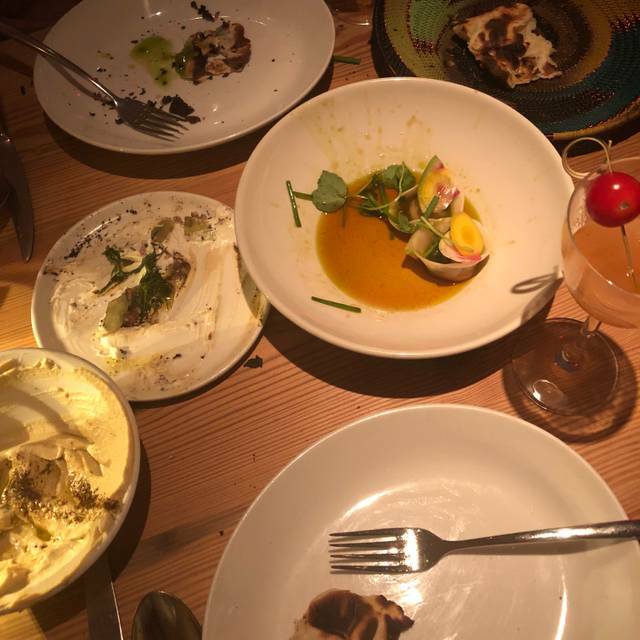 Nix offers 3 courses - dips, light plates, and bold plates. They’re all small dishes, but we found them to be quite filling. Our server suggested a plate per person per course, but we’d recommend going with 2 dips and a tandoor bread; one light plate, and 2 bold plates. That’ll leave some room for sharing a dessert, which we were too stuffed to order. The bread is basically a pretty nice nan, cooked in their tandoor oven. For dips we got the eggplant which had some raisins and pine nuts, and pepper dip, which had, our server told us, pomegranate and molasses. Was awesome. For the light course we had super-thin-sliced jicama in chili and blackberry oil and sweet potato dumplings, which were exceptionally light. For the final “bold” course, we tried the fantastic fried gnocchi, which - not complaining at all - was a fairly small serving and the cauliflower tempura and steamed buns, which was delicious but much more substantial. Service was top notch; they don’t let your glass stay empty for long (again, not complaining). The venue itself is in the middle of NYU territory - unexpected to have a high end restaurant in that neighborhood. Definitely will return - gotta support Michelin starred vegetarian restaurants. Our first experience at Nix was disappointing, not the food or service, but with an issue upon entering the restaurant. The General Manager immediately addressed the problem, corrected it apologized and ask us to come back. We did and it was exceptional all around. They got it right and we’ll definitely be regulars. Fantastic vegetarian restaurant. I was quite surprised to see some negative comments, but I was very happy with the overall experience. Good flavours, expertly prepared. Very professional and good service. The food is fantastic, the service excellent, the wine list very well chosen. Had to wait 15 minutes for our table at 9 pm on a Monday night, which is my only complaint. Took my boss to lunch and chose Nix because of its reputation for delicious Vegetarian. Food was delicious and beautiful. Staff appeared very put out by our presence. With so many options in Union Square, I will not be back. 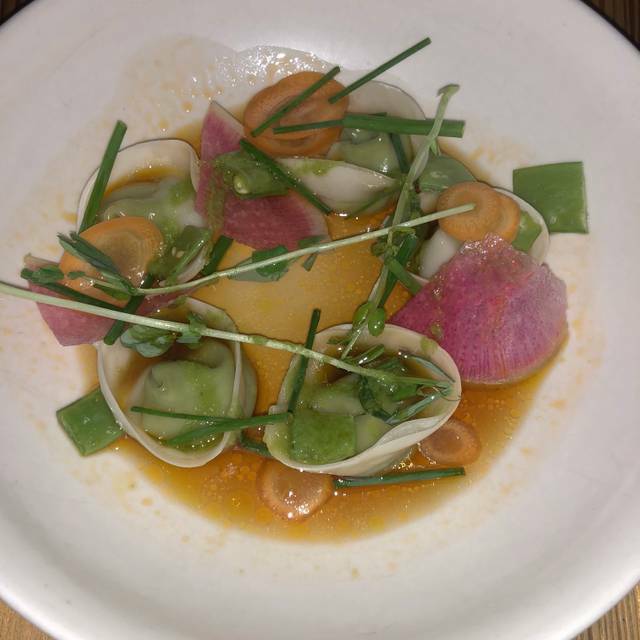 We struggled to find good vegan food in NYC so were delighted to find Nix. The service was warm and friendly and the food was interesting if a little spicy. The cauliflower tempura in particular was overpowered by the spicy sauce but the attention and care given to all the food presented was much appreciated. Brunch at Nix was a wonderful experience. The Bellini was perfect and the Cauliflower dish that I ordered was so creative and delicious. My friends Hummus bowl was equally great. For desert we shared a Chocolate Mousse that had such great flavor and was not overly sweet. The service was great and the ambiance very cozy. I would highly recommend Nix. Nix is my favorite restaurant and never disappoints. This time the Nix Benedict was a bit over cooked. Everything from food service to atmosphere was amazing!! We had a number of dishes as this was a first trip to the restaurant and we were anxious to try a range of food - we aren't pure vegetarians, just like to minimize animal protein. Perhaps it was an off night but the recipes aren't up to a high standard. Presentation is good, but the dishes were either bland or substituted cheese for flavor and creativity (a common failing of veg restaurants). The location and food is good. My patty melt was quite good and friends enjoyed the tempura cauliflower, though it is quite spicy, and the grain bowl. My drink was the best part of the meal, grapefruit and black pepper. They do not seem like a Michelin star restaurant from presentation at the door to seating, etc. The food at Nix has been absolutely extraordinary every time I've gone. The service is extremely pleasant On a Friday night it is rather noisy but I didn't have trouble hearing my dinner companions, unlike some noisy restaurants. All in all, I recommend it very highly. The staff there was awesome. From the bartenders who were so kind and aware and funny, to the manager who was amazing! He really made our evening. And I started out so grumpy. The food was not as good as we had been led to expect. However, the dumplings were exceptional. Would give it another chance and skip the “dips” section - not bad, just nothing special. Also, skip the egg salad where the egg part is just cut-up eggs. A+++++ to the staff! Doesn’t live up to the hype. I expected better food from a Michelin rated restaurant. Nix came recommended by a local who lived in the neighborhood. 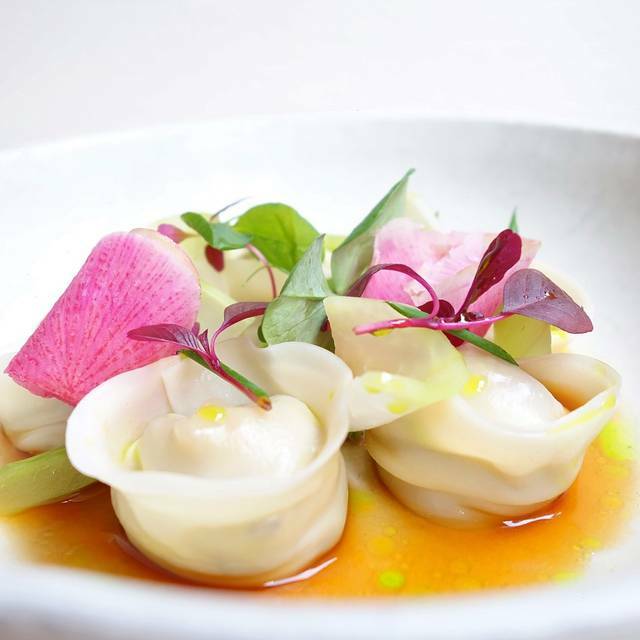 With its 1 Michelin star, I was quite excited to try this award-winning vegetarian restaurant. But honestly, it was pretty average overall, with some better than expected dishes like the gnocchi and the Nun’s puffs, and some pretty mediocre ones like the tofu with chanterelles. This last dish was obviously inspired by a common black bean Chinese tofu dish, but it did not stand out in terms of preparation or taste. The chanterelles were overwhelmed by the black bean paste and spiciness of the dish (Szechuan peppers?). Overall, it was a nice experience, the service was welcoming and warm, while the food was a bit below expectations. My friend who had recommended the place also said that the food seemed better the last time he was here. Lighting is too low. Otherwise, the experience was great. The portions are perfect for sharing and the drinks were all well balanced and delicious. 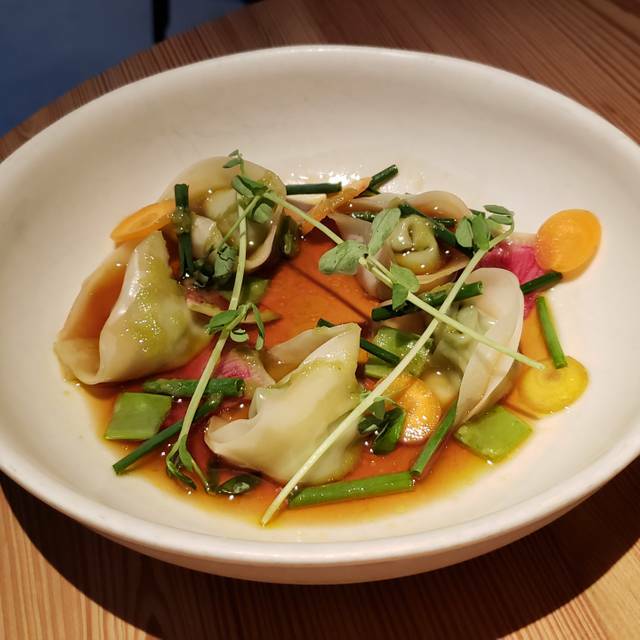 We have been to many of the high end vegetarian and vegan restaurants in Manhattan, had our favorites and kept going back until I found Nix. Looking for a change in venue we tried Nix. It has shot to the top of our go to places! The decor is chic, minimalist with smooth textures and comfortable ambient lighting. The wait staff was absolutely wonderful, very attentive, knowledgeable and personable. The drinks were superb. I had the Playa II tequila, passion fruit with a champagne foam...amazing! My husband had the Macha, bourbon, poached pear, apple and toasted green tea...insanely delicious! We tried quite a few dishes such as the Winter Summer Roll with marinated tofu that left us wanting more! For our Mains we devoured the Cauliflower Tempura with Steamed Bun, Pan Seared Gnocchi and the Shiitake Polenta Cacio e Pepe! All were beyond impressive with their attention to flavor, texture and presentation. If you haven't tried Nix add it to your list, it's a definite must!! I am not a vegetarian and I will go to this place again and again. The flavors were balanced and well thought out. There were light dishes and heavier dishes with all dishes being fresh and vibrant. My only comment though is that the gnocchi was burnt. There were pieces that were well cooked and then pieces that tasted black (you can probably imagine what I am talking about). The atmosphere was uplifting, the floor staff friendly and the menu was enticing. Each course was balanced, colourful and smacked your face with the wow factor. Definitely choose the dumplings, gnocchi and pineapple dessert and you won’t regret it. A must if visiting NYC as everything is inventive and delicious. The cocktails are fantastic and the service is stellar. We found NIX 2 years ago while visiting and couldn't wait to go back this time. It only got better! Fabulous food as always & we always take great pleasure in introducing friends to somewhere new who regularly discover just exactly how delicious Vegan & Vegetarian food can be when prepared by the amazingly talented staff at Nix! Looking forward to our next visit!